Unicorns are private companies and startups valued at over $1 billion. As access to technology, crowdsourced funds, and venture capital became more accessible over the last decade, here are the top ten unicorns that disrupted entire industries and retained private ownership during growth. With an annual GDP of $18.03 trillion, it's no surprise that the United States boats over 100 unicorns. 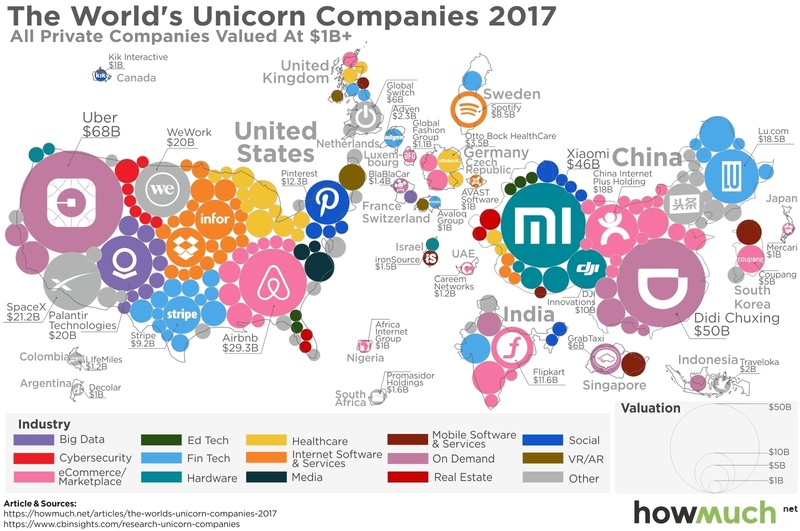 While the majority of the world's unicorns are located in the U.S. and China, India is in third place with ten unicorns, while Germany and South Korea are close behind (four and three unicorns each, respectively). A variety of societal, economic, and financial forces are creating more unicorns every day. As Americans increased their spending on transportation, founders Garrett Camp and Travis Kalanick created Uber in 2009 to lower transportation costs with crowdsourcing. Their innovation has led to expansions into carpool services, helicopter transportation, and even self-driving cars. Didi Chuxing scaled Uber's revolutionary services to over 20 million rides daily, surpassing their U.S. equivalent with the population and infrastructure of China. From carpooling, private cabs, luxury transport, and bicycle sharing, Didi Chuxing has expanded horizontally to be one of the most successful private companies this century. Xiaomi is a software and electronics producer founded by eight partners in 2010. In less than seven years, they dominated the smartphone market and engineered some of the world's most popular mobile apps, laptops, and consumer electronics. With over 8,000 employees, Xiaomi is truly one of the world's most impressive unicorns. AirBnB was founded in 2007 by Brian Chesky and Joe Gebbia, and what started as a small bed and breakfast in their loft quickly turned into the roar of enterprise as existing players in the hospitality market could not meet consumer demand. WIth 80% revenue growth from 2015 to 2016, AirBnB has since expanded to over 65,000 cities worldwide. As the world's largest, privately owned aerospace technology and space transport company, SpaceX has been pushing boundaries since its founding in 2002 by entrepreneur Elon Musk. SpaceX was the first private company to launch a spacecraft into orbit and recover it, and works with the International Space Station for cargo delivery. The manned Dragon spacecraft are positioned to lead the first instances of Mars colonization and lunar tourism for the world. Palantir is the backbone of data analysis for counter-terrorism, cyber warfare, and financial institutions. Nathan Gettings, Stephen Cohen, Joe Lonsdale, Alex Karp, and Peter Thiel founded Palantir in 2004 to revolutionize data analysis for government, healthcare, and financial services, and with a valuation of over $20 billion they have stated no intentions of an IPO anytime in the future. Telecommuting for work has grown 115% since 2005, and WeWork was founded in 2010 to provide shared workspaces in 16 different countries. With a valuation of over $20 billion, WeWork provides physical and virtual workspaces, employee benefits, and social events for location independent workers around the world. Lu.com is an online finance marketplace founded in 2011 as a peer-to-peer lending platform. Since then, Lu.com has taken its place as the second largest P2P lender in China and serviced over $2.5 billion in peer-to-peer loans. The China Internet Plus Holding company was formed by the merger of two largely successful competitors, Meituan and Dianping, in 2015. Valued at over $18 billion, they are one of the world's leaders for restaurant bookings, event ticketing and other online-to-offline services. Pinterest was founded in 2009, and with a valuation of just over $12.3 billion, the visual social media platform is used by hobbyists, businesses, and marketers worldwide. Pinterest serves as a "catalogue of ideas" for their highly engaged users on a variety of topics. The United States is leading innovation, with five of the top ten unicorns headquartered between its borders. No matter where each unicorn was founded, nearly all of them disrupted a market with an innovative product or service and leveraged lean decision making for success.